So, everyone is telling you Windows Phone 8 is way better than WP7, so different in fact, that it's impossible to run on old generation devices. For starters, here's a very detailed walkthrough of the platform, courtesy of Joe Belfiore himself. Yet, taking a look at the homescreen we see the familiar live tile Start Screen and the scrollable app list. Even most of the apps are the same as before. The first impression of Windows Phone 8 on those coming from 7.5 could be a little underwhelming. The user interface logic and looks are virtually the same. So, what's the big deal? Sure, there are lots of new additions such as USB mass storage mode (so long, Zune transfers), the rich video codec support and the deeper Xbox Live integration. Even more important, there's support for new screen resolution modes, wider hardware support and DirectX graphics. So, yes there's plenty of more power that users will definitely feel and appreciate. But the real benefit is long term. Windows Phone 8 shares code with the company's desktop OS and unified cross-platform development will hopefully soon start making a difference in terms of both the quantity and quality of apps . Plenty of extra power under the hood, will open up many new possibilities for devs. DirectX graphics will support powerful new games and even give some classics a new lease on life on a phone. But if you want to focus on the here and now, a video demo of Windows Phone 8 is a good place to start. A push on the unlock button reveals the lock screen, which displays the current time and date and shows calendar events, emails and missed calls. A press on any of the volume keys will bring the volume switch and music controls on top of the screen. What we would have liked to see here are some (preferably customizable shortcuts). As Windows Phone mandates handsets have a dedicated camera key you can always launch the camera, but what about phone, messaging or web browsing apps - you always need to unlock your homescreen for that to work. Luckily Microsoft added at least one new feature for the lockscreen – the Live Apps service allows your Windows Phone 8 to be updated directly by the apps you choose (as long as they support it) – i.e. Facebook photos and updates can pop there or Skype notifications, you name it. We are yet to see how this works though since our Windows Phone 8 testing unit didn’t come with this feature. Swiping the lockscreen up reveals the live-tile Modern user interface. It's a vertical grid of Live tiles, which can be reordered the way you like. Almost anything can be placed in the grid by tapping and holding down over an app and selecting the Pin to start option. 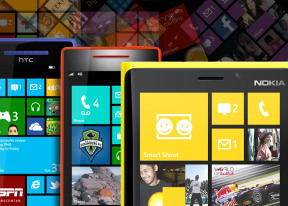 Windows Phone 8 introduces resizable live tiles, an option that will also be available with the latest WP 7.8 update. When you tap and hold on a tile, the resize option is available along with unpin. You can choose between quarter, normal and double size. Depending on which size you select you get different info displayed in the Tile. If you go for the smallest, you get nothing but a static icon, while the two larger sizes offer more info. The homescreen looks exactly the same, except that the new tile sizes let you fit a lot more There is no wallpaper, you can just opt for a dark or light background. Whatever you choose it will be the base color for every system app on the phone. Each of the Live tiles displays relevant info such as the current date, pending calendar events, missed calls, unread emails and more (third party apps do it too). For instance, the Marketplace tile displays the number of updates available, while the Pictures tile is essentially a slideshow of your photos. It's nice to have all that info always available at-a-glance. You can look at them as homescreen widgets of sorts, but that's a bit oversimplifying. WP8 offers multi-tasking as promised. It's not always true multitasking; most of the cases things are being done the iOS way. Apps not in the foreground are suspended, but the OS has ways to take over and carry out the task for them. But just like on iOS, if an app requires to run in the background (navigation clients, players, communicators, etc.) it can. The multi-tasking interface is the same as in WP7 - to switch between apps you press and hold the Back key. You'll get thumbnail snapshots of the apps, ordered chronologically left to right. You can scroll the list horizontally to select an app and a tap will bring you back to your running or suspended app. Usually, the last 8 apps are here. You can't "kill" any of those apps from here - to exit one you must bring it to front and use the Back key to close it. Windows Phone 8 can also be operated with voice only through the TellMe - you can dictate, have the phone read out the reply, you can initiate searches and so on. It's what Android's got with Google Voice and Apple with Siri , but sadly the Windows virtual assistant though is still far behind either of those. One of the new features brought by WP8 is the Children's corner. You can select the apps and types of content you want roped in and password-protected, so you can safely share your smartphone with your kids without worrying about them messing up with your settings or accessing inappropriate content. When activated, the Children's corner is accessible by a swipe to the left on the lockscreen. Without the password it's impossible to return to your standard lock or home screen. Of course, that kind of protection doesn't cover against accidental meetings with the floor. One final thing worth mentioning is the capability to set songs as ringtones. You just need to put the songs in the Ringtones folder in the phone's memory and they will automatically appear as options in the ringtone menu. Finally!